On Zanzibar itself there are a huge range of hotels, all at different prices. The best way to split up the islands hotels is into price brackets – $150-$200pppn, $250-$300pppn, $500-$650pppn and the $1,500pppn one off ridiculously lodge! $150-$200pppn: Echo Beach, Mchanga and Shooting Star are all good options with ten or so rooms that have proved over time that they offer a reliably good product at a good price. The accommodations are good but in all honesty cannot be described as luxurious – it’s being on the great beaches with sand amongst your toes, good food, privacy and a good range of optional activities that make these places work so well. My preference at this level is Echo Beach due to its relaxed atmosphere and obscenely good food for the price. The next place I’m going to mention is the famous Breezes Beach Resort. Breezes is a fairly large 80 room resort complete with swimming pool, tennis courts, great all round facilities including a spa and a very good dive and activity centre. The lodges has never been in this price bracket before but due to their various offers in 2011 (which exclude July and August), Breezes come in at approximately $150pppn ($180pppn for short stays). It is without any doubt the best of this resort style accommodation…by a long way and is especially good for families. Breezes has never been as affordable as it is this year, and for clients wanting luxurious accommodation at this price tag, it really is a great option. For a large resort Breezes also caters remarkably well with couples and honeymooners and in my view is a great hotel all round. The only negative is it slightly lacking on the intimacy that you can find elsewhere on Zanzibar, or its neighbouring islands. Echo Beach is a firm favourite with Mchanga and then Shooting Star. However Breezes is such good value in 2011 that it has to be considered due to the quality of accommodation. Breezes offers higher levels of facilities and accommodation than the other accommodations in this bracket – you just have to want a large resort. Other options that were considered in the $150-$200 bracket but that we find inferior – Pongwe Beach Resort, Matemwe Beach Village, Blue Bay and a number of large all inclusive options. Please phone us to discuss our reasons why! Ras Nungwi is an old favourite of ours and over the past few years has been getting exceptional feedback from clients. We send a lot of business here! It is a four star hotel that will deliver great service, food and hospitality in a great setting – the beach is superb. Ras Nungwi also has one of the best dive operations on the island and has access to Nungwi village where there are bars and restaurants to explore. With 35 rooms it is not quite a resort but Ras Nungwi is larger than Zanzibar’s small hotels and so caters well for clients wanting the facilities of a large resort but the intimacy of a small boutique hotel. In summary, you can trust Nungwi to deliver a great product at this price; it remains an office favourite. And what a beach! Slightly more expensive is Matemwe Bungalows (now called Matemwe), a charming small lodge on the edge of a small coral cliff looking out to the famous Mnemba Island. The lodge has a real emphasis on an eco-sensitive approach to operating which is noticeable in the lodge build and the involvement with the local community. The rooms are spacious and simple and have an atmosphere that emphasizes the lodges wild location. It is a lodge away from all the commercial hustle and bustle of Zanzibar and works well with people who don’t mind the fact that the eco approach means you lack a few western comforts! In summary Matemwe is a lovely old lodge and although it is somewhat battered by the sea spray and wind that its exposed location receives, it’s a lovely lodge that is classic Zanzibar……but we could never call it truly polished! There are two new hotels in the $250pppn price bracket – Kasha and Kono Kono. They have been open for over a year and are starting to become pretty well established. Kasha is right by Matemwe Bungalows and has management who are making the lodge a serious success. They are also currently offering three nights for the price of two (and six for four) taking this lodge down to not far off the $150pppn price bracket! A great option considering the quality of the accommodation and management but beware, there literally is no beach here. Kono Kono on the other hand has a superb beach and also has arguably the best rooms of all the lodges we have spoken about so far. Kono Kono has the most remote location of anywhere on Zanzibar and is certainly for those who want privacy – you genuinely feel away from everything here, a little too much so for some of our clients! Service in 2010 was temperamental at best – something clients have to know before they visit. But sort this all out and Kono Kono has the potential to be the new big thing. The last lodge we consider in this price bracket is Unguja, a lovely small lodge at the bottom of Zanzibar. Family run the character of this lodge is tangible and you can really relax into your stay here. They have access to great dive and snorkelling sites but again, Unguja falls down on its beach simply because there isn’t really one! We have always been of the opinion that the best thing about Zanzibar is its beaches…..so we don’t sell much of Unguja. Having said that, for clients who are more active or who don’t mind relaxing by the pool instead of the beach, this lodge is a great choice – the accommodation is superb. $250-$300 price bracket: Ras Nungwi will deliver every time. Its bad management issues are far behind it nowadays and it is the best choice in this price bracket. Matemwe is unique but can sometimes seem a little rough around the edges and slightly too eco. Its important to know exactly what to expect from Matemwe. Kasha is a great choice for service, management and rooms and it is a great price…shame about the lack of beach! Kono Kono has all the potential, but currently needs to be given a wide berth! Unguja, like Kasha has everything right….just a shame about the beach. Other options that were considered in the $250-$300 bracket but that we find inferior: Shooting Star suites, Fumba Beach Lodge, Kempisnki Hotel, Anna of Zanzibar. Please phone us to discuss our reasons why! 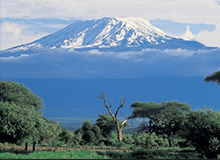 Moving up a price bracket to the $500pppn – $650pppn range, and you start getting hotels that will offer accommodation to compete with the countries best safari hotels. 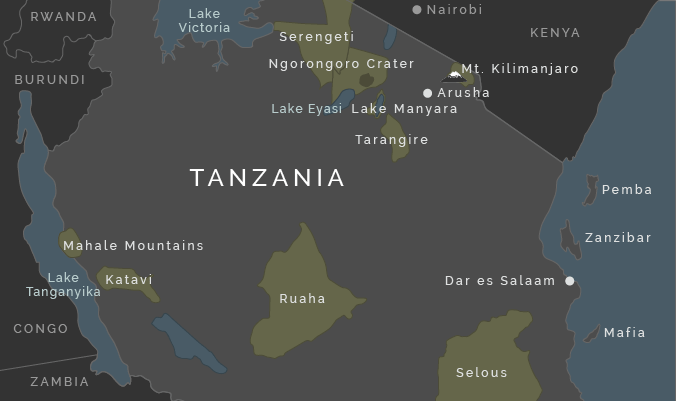 (this is a serious issue, don’t come from the best safari lodges and expect the same quality of experience on Zanzibar unless you pay over $500pppn!!). Matemwe Retreat is a collection of four suites located right next to Matemwe Bungalows. With two floors, private plunge pools and butler service they offer the best accommodation on the island for privacy. However, as with Matemwe Bungalows itself the Retreats have to be sold correctly and do not offer the level of Western polished ’ luxury’ that some clients come to expect from this price bracket. You pay for the privacy, the butler service and the wild remote location….not the opulent luxury of the actual rooms! Plus its not really all inclusive….cocktails still cost and the drink choice in the rooms are poor. Kilindi is a fairly new lodge on the North West tip of the island, very close to an area called Kendwa which I will touch on later. Kilindi has the islands best accommodation with massive suites complete with two plunge pools and striking design. Kilindi is a lovely property and having recently been taken over by the Elewana hotel group which has reliably good service. The one drawback of this property however is that the beach here is poor…so Kilindi is best viewed as boutique off the beach and a lodge where clients spend most of them time in their beautiful rooms or by the main pool. It is not a lodge for beach lovers. Having said that, only 5 minutes round the corner and you have Kendwa, arguably the best beach on the whole of Zanzibar! In the same price bracket you then have Palms and Baraza, two hotels down on the East coast. Palms is a small 6 roomed lodge that albeit ten years old still offers luxurious accommodation and undeniably good service – the hotel group that runs these properties (Breezes) has proved over time to be exceptional. Palms is exclusive and focuses on looking after couples. Baraza is the new addition to the Breezes collection – a stunning but much larger property (30 rooms) that caters very well for families, and couples that are looking for resort style hotels. We can definitely say that between Palms and Baraza you have the best accommodations in the $500 – $650pppn price bracket. We have always said that the service and accommodation levels you get here live up to the price tag and most importantly, that the hotels are the first properties that can really live up to the quality of the best safari hotels. All of these lodges are of a great quality and will not seem like a drop down from any of the safari hotels. Baraza is probably the best but it is questionable for couples due to its lack of intimacy. It is however a superb choice for families. Palms Zanzibar, even though it is surrounded by Breezes and Baraza, is the best choice for people wanting utter privacy, where as Kilindi has the best rooms of all in this category…..but a poor beach! Matemwe Retreat does not have the service levels of the others…so sits in last place for our favourite hotels in this bracket. Other options that were considered in the $500-$650 bracket but that we find inferior: The new ‘The Residence’ has all the potential to be superb so we cannot call it inferior. However we always avoid new hotels on Zanzibar and so are choosing to give this hotel a miss until it has been operating for at least six months. Give it time though and we have no doubt The Residence will be a serious player. The final lodge to talk about on Zanzibar is Mnemba Island, just off the North East Coast. Mnemba is a small island seemingly lost from the Maldives. It takes about twenty minutes to walk round and is picture perfect. With by far the best beach in Africa, and a surrounding sea with amazing coral reefs, Mnemba is nothing short of exceptional. However, at approximately $1,500pppn it probably should be……….! We would love to hate this lodge due to its obscene price tag, but our own stays on the island and the fact that Mnemba has won so many awards result in Mnemba’s reputation and price tag speaking for itself. This lodge is unquestionably one of the worlds finest beach accommodations, and is the destination for Celebs visiting Africa. As a final, last word on Zanzibar – lets talk briefly about Kendwa – the hippie hang out! If clients are looking for very economical lodges then the place to look at is Kendwa – a travellers hang out with a handful of very cheap lodges and more recently a couple of larger package hotels. Kendwa has a young travellers vibe and is not a place we recommend for clients looking for privacy or a sophisticated beach experience! The beach here however is one of the very best on the island and for clients looking for a lively, hippie vibe then the area around Kendwa Rocks has a great feel and accommodations at less than $100 a room! They are certainly not the most luxurious accommodations located here and Rastas will do their thing during full moon beach parties….but there is something unique about the area and its atmosphere. 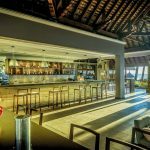 Kendwa can actually be a great choice for people wanting to save money having overspent on safari and the Kendwa Rocks Hotel kitchen is remarkably good….but you have to know what to expect of the area. We send very few clients here…..but the area is talked about, and deserves a mention. Options not on Zanzibar – the mainland coast and other islands (Pemba and Mafia)….and Mozambique! There are three lodges worthy of a mention on the mainland coast. The first to talk about is THE office favourite anywhere – Ras Kutani. At $315pppn or $360pppn in a suite it is an utter bargain; the best value of anywhere. Were this lodge on Zanzibar it would definitely sell at well over $5-600pppn! The quality of food, service, accommodation style and importantly value is some of the best in the entire area. Polynesian in style Ras Kutani blows clients away with its relaxed but seriously good levels of service and accommodation. Rooms here, especially the suites are superb. 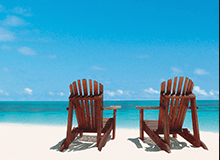 It is certainly true to say that the vast majority of our clients find it their beach highlight. The only issue with Ras Kutani is that there is very little snorkelling and no diving, however there are enough activities to keep you occupied for a few days (three at most ). Ras Kutani is all about R&R….at which it is exceptionally good at! 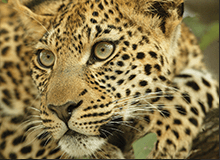 We include Ras Kutani on every possible itinerary….sometimes just for two nights before you go on safari! Amani Beach Club just down the coast from Ras Kutani is very good value, at approximately $100pppn on a b&b basis. The lodge shares the same beach as Ras Kutani but does not match up to the quality of Ras Kutani’s accommodation or service. 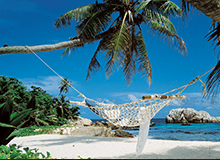 A great option however for people looking for an economical beach stay off Zanzibar. Pemba has one lodge to talk of that splits the office – Fundu Lagoon. The MD here Marc is not a fan, but all of us, urm younger consultants are! Fundu is a cool beach lodge that is great for younger adventurous clients that are trying to stay away from the Zanzibar crowds. The lodge has a range of different rooms, from standard tents to luxurious tented suites that have a price tag to match. (Fundu is not a cheap lodge, even in the standard rooms). Marcs issue with Fundu is its beach, which is poor in comparison to any on Zanzibar. However since he visited, the lodge has built a large swimming pool and also offers access to Mesali island just off the coast. 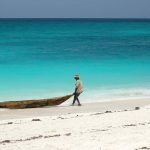 Mesali’s closest comparison is Mnemba – ie utterly stunning….so as long as you are prepared to get on a boat each day you can get a wonderful beach. Plus the diving here is better than anything on Zanzibar and the lodge itself has three different areas to eat and relax in, rather than just one restaurant – something that the majority of hotels on Zanzibar lack. 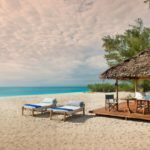 In summary, we love Fundu and it certainly offers more than many lodges on Zanzibar… but expect to pay a high price for choosing to stay here, and don’t expect great things from the accommodation unless you pay the money for the suites! Mafia is as remote as you get. A sleepy island where goats cross the runway as you land! It is an island for adventurous travellers who really want to try something different. The first thing to say about Mafia is that none of the lodges here have good beaches and in all fairness, none of the lodges here offer any kind of luxury. In a nutshell, don’t come to Mafia if you want R&R in a luxurious lodge with a lovely beach….they don’t exist! Mafia is for people who want to explore the island and its coral reefs. It is a great island for people who want to go out from their lodge all day and go diving, snorkelling and exploring. Just don’t rely on the accommodation here, the best ones are rustic… where as the others are simply rough! Chole Minjini epitomises Mafia – an adventurous, treehouse lodge which is unique, eco and great fun. There is no beach here (of any sort) but the accommodations are raised up into the trees and are superb fun for people wanting something different. The toilets however are literally holes in the floor which go down to compost below….not something your average bride is happy to have on her honeymoon! In summary, a great lodge that offers something truly unique….but know what to expect! Kinasi Lodge is probably Mafia’s most well known property. The lodge was once the owners home and although has received various upgrades and refurbishments over the years, you cannot help but notice it is a little dated. Kinasi however does have a pool, clean and tidy rooms and one of the best dive operations on the island. Considering in our view diving should be one of the main reasons for clients deciding to coming to Mafia, Kinasi is definitely a good choice for the right client. Pole Pole is the last lodge we are going to talk about. Loved by some of our competitors, Pole Pole (meaning slowly slowly) is a lovely lodge where you don’t care about time and are encouraged to be as horizontal as possible. Located right by Kinasi but without the swimming pool or the unique design of Chole, we question why clients would choose Pole Pole over the two mentioned. The final reason that we don’t send many clients here is simply because the lodge is the most expensive of the three and we cannot really justify the reason why!